Lottie's entire family is devastated when her Aunt Helen dies young from cancer. Although the loss is personal to them, Helen's death affects the rest of the world as well since she was the author of one of the most beloved book series of all time. In her will, Helen has left a series of letters for Lottie, one to be opened each day. The letters are some of her last thoughts along with some specific tasks for Lottie to do which push her out of her comfort zone. Lottie has always worried about death but now more than ever and Helen tries to get Lottie living. 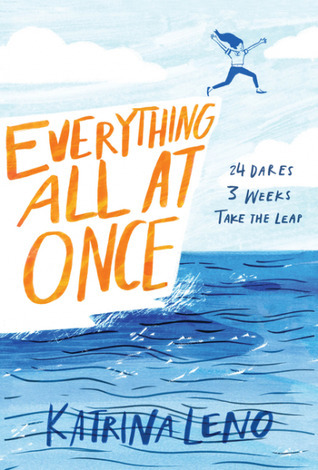 Parts of this book were tough for me to read because Lottie's worries are described so clearly and echo some of my own thoughts about disease and death. In addition, her grieving for Helen is palpable as she works on going on. I was especially moved by the scene with her dad who is going through his own grieving process about the loss of his sister. Starting my review with all that makes the book sound like a real downer when in reality it is actually focused on enjoying life. Lottie is uncomfortable with things she is doing but she does them and finds herself learning more with each task. This is one of those fairly quiet books that draws you in without giving an easy hook with which to describe it.